Sunday evening I was part of a conversation with participants from many groups (including but not limited to Code Pink, KnowDrones.com, National Coalition of Nonviolent Resistance, NoDronesNetwork, UNAC, Upstate Coalition to End Wars & Ground the Drones, Veterans for Peace, World Can’t Wait) and individuals working on opposing drones from around the country. The inspiration for the call was the increased attention – and protest against – the U.S. drone war and targeted killing, brought on by the release of the White Paper just before the Brennan hearings, and the successful protest by Code Pink at the hearings, causing it to be closed to the public. Broadcasts on PBS Nova and Bill Moyers, a cover story in TIME, and thousands of news stories about the Obama administrations’ justification of targeted killing, expansion of executive power, and secrecy on the program have brought the question to light. 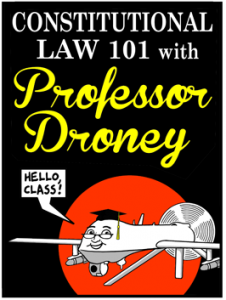 One of the best cartoons was by Tom Tomorrow: Constitutional Law 101 with Professor Droney. On the call, much appreciation was expressed for the eight people who disrupted the Brennan hearing February 7, including Ann Wright. They were arrested and have a court appearance in March for disrupting Congress. Code Pink is following up with lobbying efforts, after visiting the offices of Senators Feinstein and Chambliss from the Senate Intelligence Committee, which continues secret hearings this week on Brennan. David Swanson reported that after the resolution against drones passed by Charlottesville VA City Council, he’s hearing from other cities preparing resolutions against drones. Nick Mottern of KnowDrones.com reported that more than a dozen locations have replica drones, and more on order, prompting him to raise funds to buy a mold so that they can be produced more easily and quickly. Joe Scarry reported on a series of regional conference calls planning actions at NoDronesNetwork. Seattle is sending its two surveillance drones back to the manufacturer, an action which may have prompted Portland, OR, to cancel plans to acquire drones. Actions in April as part of the month of coordinated protest at manufacturers, research institutions, and bases are being planned in Chicago, New York City, Syracuse, Pittsburgh, Boston, the Pacific Northwest, San Diego, Wisconsin, and monthly protests at the CIA may extend to week-days. Find more here and get involved. Please communicate with Nick Mottern via nickmottern@earthlink.net with follow up comments.